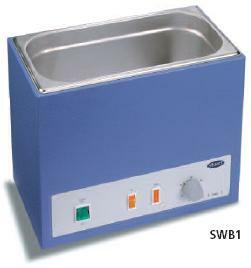 This range is now obsolete and has been replaced by the Stuart Digital Water Bath range. Similar robust construction to the analogue baths described previously but with an easy to use digital control to both set and display temperature. Electronic control ensures good temperature stability. Selection of bath temperature is easy and accurate via the digital LCD display which also gives a read-out of actual temperature. Electronic control ensures good temperature stability. In addition, there is an adjustable over-temperature cut-out to protect the bath and samples from control failure. Accessory bath covers are also available to help reduce heat losses and evaporation. The gable shaped covers are manufactured from stainless steel and have an insulated handle.